Luxury Banner Stand - Free shipping Worldwide! As a bonus we are proud to upgrade from a vinyl banner to a luxurious matte satin banner at no extra charge! 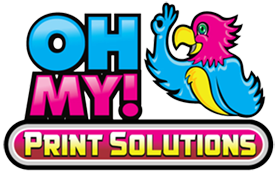 The print quality will ensure that you stand out among your competitors. Wholesale rates available for bulk purchases. *NEW! Printed with a luxurious matte non-glare satin banner! The Luxury Banner Stand is a water drop style that is quite a bit nicer than our basic banner stands. These are recommended for clients who want to use these often at several trade shows or events per year. They’re also great for retail displays as they have a decorative silver coloured cap. Each banner stand comes with a soft padded case included in the price. A benefit of a Luxury Banner Stand is the fact that you can replace the graphics with ease, without the use of tools or double sided tape as the Matte Satin Fabric Banner clips onto the bottom. No professional installer needed! Let us Handle your Logistics! We often work with clients who have branches all over North America. They may order 10, 20 or even 100’s of banner stands and leave it up to us to distribute them to each location as opposed to shipping them all to their head office and shipping it themselves. With our expertise as well as our bulk shipping discounts we get from our logistics partners such as Fedex, DHL, UPS, and TNT we can often offer our stands at less of a price than if you shipped it yourself. Not to mention it would take the hassle out of all that paperwork. Contact us now for details! Luxury Banner Stand – A higher end look! A Luxury banner stand is retractable and an inexpensive way to promote your brand. They include a Matte Satin Banner. It is very beautiful and ensures you stand out among your competitors. The colors pop. It is a non-glare fabric contrast to vinyl banners. They offer a quick way to pop up a trade show. A marketing activation, a retail set up and more. We offer our Luxury banner stands with Satin or Vinyl banner printing. Or a beautiful polypropylene (PP) film. It is just starting to get popular nowadays. We offer bulk discounts and wholesale rates. 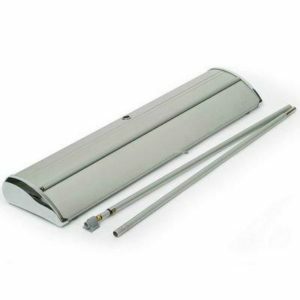 Each retractable banner stand comes with a nylon carry case. It is suitable for easy transport. To set up simply take out of the case. Insert the rod at the bottom. Lift and place the vinyl banner on the rod. Within 1 minute or less, your trade show display is ready to go! These are top quality. Easy to use. It looks nice contrast to your typical regular stand. Luxury Banner Stands are very popular. In our headquarter city here in Vancouver, BC. We ship anywhere throughout Canada, USA, and many places worldwide for free. This includes Edmonton, Calgary, Regina, Toronto, London, Windsor. It includes Oshawa, Ottawa, Montreal, Quebec, Fredericton, Moncton and more. We regularly ship to California, New York, Florida, Texas, and all 50 states. Including Puerto Rico. Europe, France, Netherlands, Australia, UK, England, Dubai, Panama, Worldwide. 31.5" x 80", 33.5" x 80", 47" x 80"